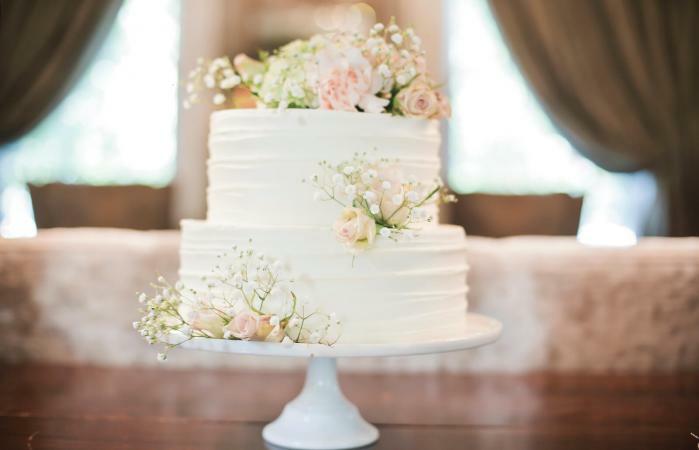 Simple wedding cakes with fresh flowers can be elegant, minimalist confections that are a beautifully sweet way to celebrate a couple's union. 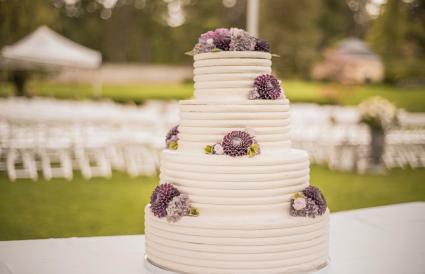 With many styles to choose from, couples are sure to find a fresh flower cake to complement their wedding festivities. A simple cake can look distinctive and luxurious when decorated with fresh flowers, but despite a minimalist approach, there are many ways to decorate the cake beautifully. While rose wedding cakes are common, there are plenty of other flowers that look lovely as well. This is one of the most popular ways to use flowers on a wedding cake. 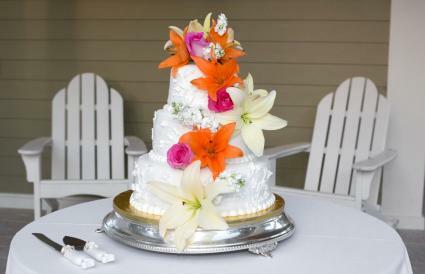 Starting either at the top or near the top of the cake, the flowers cascade down the sides in a smooth curve or spiral. Straight cascades can be used, or multiple cascades can be added to larger cakes for a lovely floral decoration. Separating a cake's tiers with layers of colorful blooms is an elegant way to add fresh flowers to even the simplest of cakes without overdoing the design. 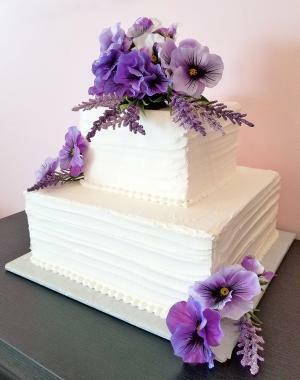 If the tiers are not spaced apart, flowers could be used to line the crease where the tiers connect. Many couples create beautiful simple wedding cakes with fresh flowers by using blooms as a colorful wedding cake topper. On a larger cake, a floral topper could be combined with the traditional bride and groom figurine piece, or figurines may be displayed on the cake table or omitted altogether. Larger or more intricate blooms look best when simply scattered around the wedding cake artfully. This is especially effective when the cake is smaller and would be overwhelmed by large numbers of flowers, or if the flowers themselves are unusual and distinctive. Adding flower petals can also add floral detailing without needing too many blooms. 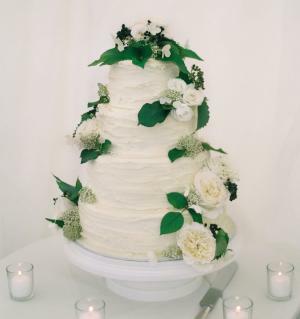 Using greenery with your fresh flowers gives your cake a natural look. It can be rustic when combined with a naked cake or it can simply add more color to a plain cake that has few decorations. Decorating wedding cakes with fresh flowers is not as easy as it may seem. The couple, along with their baker and florist, needs to consider issues of safety and presentation when coordinating this type of floral motif. Choose blooms that can safely be used around food. 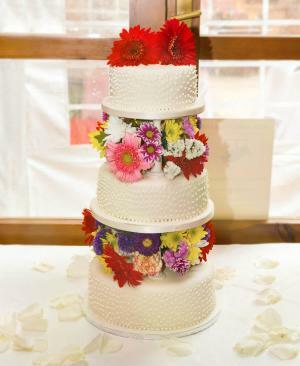 Use hidden plastic picks to hold the blooms; never insert floral stems into the cake. Instruct caterers serving the cake to remove flowers and not put them on guests' plates to minimize any potential problems. Choose flowers that coordinate well with the wedding décor, perhaps matching the bride's bouquet or the wedding reception centerpieces. Ask whether the baker and florist can coordinate the cake flowers or if a member of the bridal party will need to deliver blooms to the bakery. If possible, use stem picks with small water reservoirs to keep blooms fresh. 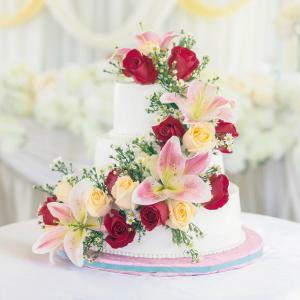 Keep flowers chilled prior to decorating the cake and keep the cake chilled as long as possible to prevent wilting. 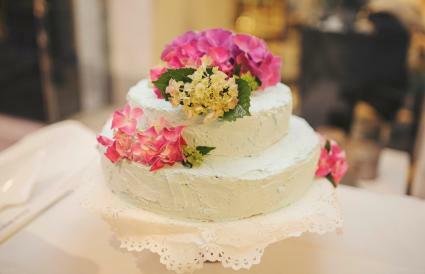 To highlight the flowers, a simply decorated cake is best, with icing to coordinate with the color of the flowers. Details such as icing dots or small embellishments can subtly add more intricacy to the cake, but too many details can be overwhelming. These cakes can be a gorgeous centerpiece of a wedding reception as well a delicious dessert for the happy couple to share with their guests. With many styles to choose from and dozens of blooms that can be stunning decorations, there is a way for every couple to incorporate beautiful blooms into their wedding cake designs.